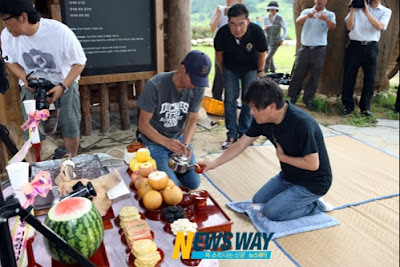 The casts & crew of Faith held their prayer ceremony on July 10, 2012 and I also pray with them that this drama will be a very successful one. I'm so excited for Faith. 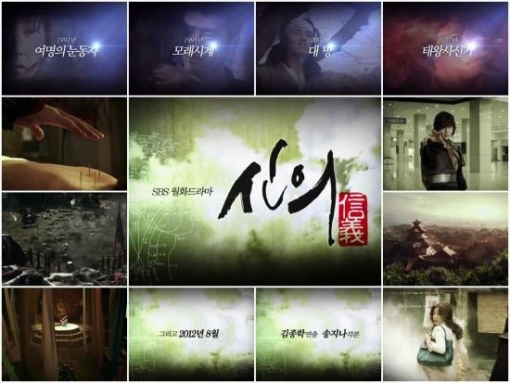 To be honest, this is my #1 anticipated drama of the year (okay, Arang and the Magistrate is also included in my "anticipated drama of the year" list). Lee Min Ho & Lee Jun Ki (plus cutie Shin Min Ah & Yoo Seung Ho) weekly overload. I'm very glad that these two dramas won't go head-to-head (Faith will be aired in Monday - Tuesday while Arang and the Magistrate will take up the Wednesday - Thursday slot). Lee Jun Ki was the top contender as Choi Young, but unfortunately he has to drop out from this drama because of army duty. 3 years later, Lee Min Ho was finally cast as Choi Young. I love Lee Min Ho; so no complaint here :D Kim Hee Sun was cast in 2009 and she patiently waited to play in this drama as Yoo Eun Soo. Faith has been in production for 3 years and produced, directed & written by the same PD & scriptwriter who did Sandglass & The Legend. Looking at the first trailer released yesterday (screencap below), I know we're in for a huge treat. Gorgeous cinematography, brilliant script, stunning background music, and great acting.